You can purchase the new Total Gym Core Trainer BLAST on Total Gym Catalog. Core training should be a fundamental part every workout. Total Gym makes core strengthening exercises accessible to everybody. 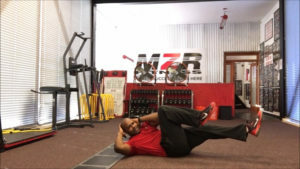 Specifically, the Total Gym Core Trainer provides a functional abdominal workout by recruiting and training the deep muscles of the core, including the stabilizers of the spine. It’s simple to manage for first-time equipment users and it’s easy to progress the exercises to challenge even the most fit athlete. You can also use the Total Gym XLS with the appropriate equipment accessory (AbCrunch). The base position for all core workout routines on the Core Trainer is a plank using the elbows for support. To add difficulty, the arms can be extended. Adding a dynamic aspect to the basic plank, the glideboard creates instability, which recruits additional muscles for an exceptional core strength workout. Focusing on the plank leads to spine and hip joint stability as the muscles around these joints are strengthened. First decide which plank support you’re going to use: hands or elbows. Next, either rest the knees on the glideboard or press onto the toes (with knees floating over the glideboard). Side plank can be performed with lateral leg abduction, front knee or leg lifts, back leg extensions and leg circles. The combination exercise side plank with lateral leg abduction is challenging. It requires coordination of the core muscle groups on both sides of the body in opposition to each other to prevent falling forward or backward or down. Plank to pike: plank can be on hands or on elbows. Concentrate on lifting the hips toward the ceiling, sucking in the gut, and tucking the head between the arms. Keep the legs as straight as possible. Moving down so that the feet are on the ground and the elbows or hands are on the glideboard, the board can be placed in closed or open position for leg and knee lifts and pike. In open position, the glideboard can also be moved with the elbows or hands, which opens the shoulder joint and engages muscles of the chest. 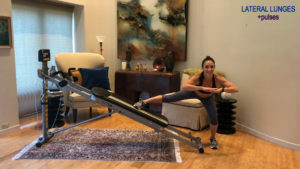 To target the upper chest and back, place the feet on the glideboard in open position and place the hands on the floor so that the body is inverted. This position will also emphasize back extension as you move the glideboard up the rails against gravity. This abdominal workout machine by Total Gym is a versatile piece of equipment that can help beginners get in touch with their core and challenge athletes to step up their game.